Is AMD's new Trinity fusion chip for thin-and-light laptops an Intel Ultrabook killer? If the future of computing is all about mobile devices, the future of computer chips is increasingly about squeezing in more features into ever less space. Enter the AMD A10-4600M, the latest all-in-one chip for portable PCs. Previously known under the Trinity codename, the AMD A10-4600M is exciting for several reasons. For starters, it's our first taste of AMD's new Piledriver CPU architecture. Piledriver is a development of AMD's radical Bulldozer CPU design. Regular TechRadar readers will know that Bulldozer promised much but delivered relatively little. It's a thoroughly intriguing design in theory, thanks to its modular architecture. But in the final reckoning, it's performance that really matters and Bulldozer didn't dish enough up. So, we're awfully keen to learn whether the revised Piledriver design can turn Bulldozer's theoreticals into useful processing reality. The AMD A10-4600M is also the first Bulldozer-derived chip of any flavour to integrate graphics functionality. 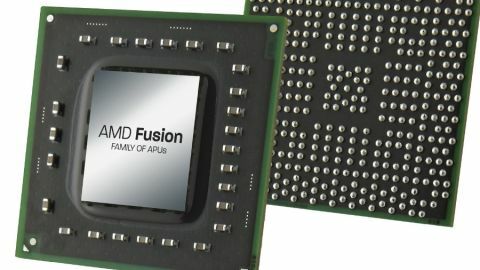 AMD's previous fusion processor (also known as Accelerated Processing Units or APUs for short), the chip codenamed Llano, was based on AMD's older Stars core as found in the Phenom II and Athlon II chips. It's an architecture that is relatively little changed since the original Athlon 64 was launched was back in 2003. But it's not just the CPU cores that are new inside the AMD A10-4600M. The graphics core has had an update, too. Admittedly, it hasn't been brought right up to date with AMD latest Graphics Core Next (GCN) architecture. But it has received a number of upgrades along with a significant clockspeed bump. Put the whole package together and you have a chip that promises to keep Intel's mobile processors for Ultrabooks, like the new HP Spectre XT, honest. Ultrabooks have been a big hit for Intel and there's no doubting the thin-and-light remit makes for desirable portable PCs. But in terms of keeping the market competitive and prices under control, it would be great if AMD could throw something into the mix to frighten Intel. What's more, it might just make for a much more affordable and portable alternative to all those big money, heavy weight gaming laptops out there. A cheap laptop with game-worthy integrated graphics really would be big news. Meanwhile, we're also very interested to see how the new A10 compares with outgoing Llano chips, like the AMD A8-3500M.